From the 4th November 1973 there were a number of Car Free Sundays in the Netherlands. The Dutch had supported Israel in the Yom Kippur War in October 1973. This was reason for some of the oil producing countries to reduce the production and consequently deliveries to the Netherlands and several other countries. Due to this oil crisis, petrol was to be rationed from 7th January 1974 on. To curb oil-consumption before that measure took effect, the Dutch government announced the complete ban of private motorised traffic on a number of Sundays, from the 4th November 1973 until the 6th January 1974. It meant the 3 million cars the Netherlands had at the time (there are 8 million now!) could not be used from Sunday mornings 3 am until midnight (so people could still return from their Saturday night outings). The papers showed empty roads after the first Car Free Sunday and all kinds of transportation people had used instead. There were pictures showing long lines for buses, all kinds of bicycles and even horse-drawn carriages. Dutch newspapers from November 1973 with news about the “Autoloze zondag” or Car Free Sundays. 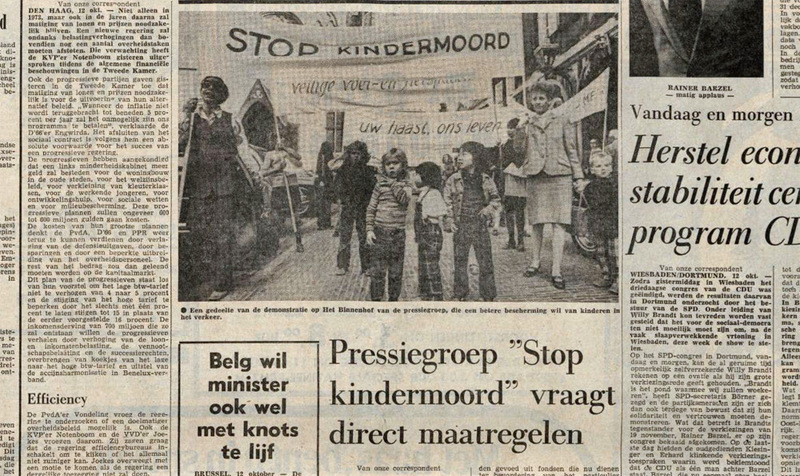 One year earlier, in 1972, the “Stop de Kindermoord” (Stop the Child murder) organisation had started their work: protesting to get safer streets for children. From a very interesting interview recently on BBC Radio with Maartje van Putten, one of the mums involved from the beginning, it becomes clear that this organisation used the Car Free Sundays to make their point even better: streets need to be for people. The ‘pressure group’ called “Stop the Child murder” was very active. This newspaper reports on a protest in front of the buildings of the national government in The Hague. This is a well known image in a slightly different version. This picture shows a third banner that reads: “Your hurry, our lives” . Even though this was not the first time the Netherlands had experienced Car Free Sundays (in fact there had been Car Free Sundays in 1939, 1946 and 1956 as well) the 1973 Car Free Sundays changed something in the Dutch mindset. Not only did they show once again what cities looked like without cars, they also made it possible that other forms of transportation, less oil dependent and in particular cycling, were seen as a viable option for every day transportation. This line of thinking would ultimately change the Dutch transportation system into what we have today. Last Sunday night a new bridge opened to motorised traffic in Nijmegen. But earlier on that Sunday, it was only open to people walking and cycling. Making it look almost like the roads were on the Car Free Sundays of 1973. Some cycle experts took the opportunity to remind people that it had been 40 years since those important Car Free Sundays that were one element in the mindset change that the Netherlands experienced in the 1970s. 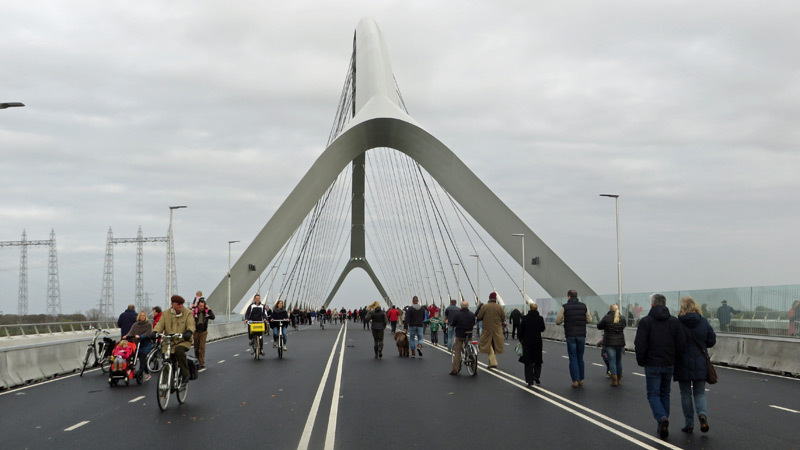 The new bridge in Nijmegen was car free on Sunday 24 November, reminding people of the Car Free Sundays 40 years earlier. Nobody had to look out for emergency vehicles and doctors rushing to patients this time and the video shows people of all ages and backgrounds walking and cycling and admiring the new bridge. To the right in the video is a very nice and wide two-way cycle path (visible towards the end of the video). I will show you that cycle path in a later video on a normal day. But first: the spirit of the 1973 Car Free Sundays on a 2013 Nijmegen bridge. Pingback: Imagine Freeways Completely Devoid Of Cars (allday.com) | A post-automobile world? Wow! A vision of the future perhaps? That’s how wide a shared-use pedestian/cyclist bridge should be, not the paltry one or two metres we usualy get in the UK! This is common in the United States now. Before a new motorway or airport runway opens, it becomes part of a walk/cycle event, sometimes to raise money for a health charity. Really impressed with this and doubly so because of the Dutch mindset to make these decisions about controlling motorised traffic. Like minded people in the UK can only dream of living with this sort of healthy culture. Can you tell me what type of camera you use. as no cyclist in the Netherlands appears to wear a helmet, is it bar mounted or hand held? I use a tiny hand held camera. Not too heavy to hold and people have no idea I’m filming them. They think I take pictures. We had a similar event – well, actually not very similar, as you will see – when the Hindhead Tunnel was opened here in 2011. The tunnel was built as a relief road for the last remaining bottleneck on the A3 trunk road from London to Portsmouth. (Last, that is, until the next one – as always with road building, you simply move the problem somewhere else, in this case to the town of Guildford). It also has many incidental benefits which make me grateful that £371 million was spent on building it – a large are of publicly owned heathland and forest previously cut in half by an uncrossable road was reunited, and made peaceful again. In May 2011, a few months before the tunnel was opened to traffic that August, an event called “Tunnel Vision” was held. The public could apply for tickets (for a small fee to cover bus transport back from the other end of the tunnel) to walk through the tunnel one afternoon. I tried for tickets but didn’t succeed. No-one I know did. Rumours circulated that all the tickets had in fact been pre-allocated to the “great and the good” – local politicians and other worthies. Local cycle groups asked to be included in this event. They were refused. Apparently it was considered to be too dangerous to pedestrians! Oh, the irony! Over the last decade motor vehicles have killed almost 300 times as many pedestrians as cyclists have. 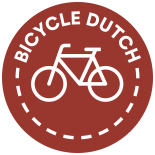 This entry was posted on 1 December 2013 by Bicycle Dutch in Original posts and tagged campaigning, children, history, Nijmegen, protest, Stop de Kindermoord, watching people cycling.